Welcome to Cub Scout Pack 486! This page will provide all of the information you'll need to get your boy(s) started in scouting. How do I register my son for Cub Scouts? What rank and den will my son be in? What is the difference between a den and a pack? 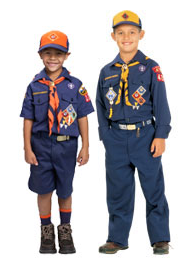 What does my Cub Scout need to get started, and where do I buy it? I've got everything he needs...now what? How do I get information...is there a website? How do I track my Cub Scout's progress?